The next step is to enable the boot flag (it will toggle a flag in the ROM so the firmware will load and execute code from the SD card). That appears to be a diagnostic feature in Canon's bootloader, present since DIGIC 2 or maybe earlier. It's the first time we are trying this procedure on DIGIC 7; the same code was tested on 5DS first, then on 80D, 750D, 760D, and 7D2 without surprises. Very old versions of the boot flag enabling code caused some issues in the past (years ago): when they were run from LiveView, the "erase" step of the ROM flashing procedure succeeded, but the "write" step failed; as a result, the entire boot flag area was set to FFFFFFFF. Luckily, this was still a valid configuration with a ML card inserted, but the camera refused to boot plain Canon firmware and asked for a firmware update. Placing Canon's firmware update on the card fixed the issue. Now we are running this code directly from bootloader. Source code is on the recovery branch (i.e. bootloader experiments, with portable code that runs on all EOS cameras from DIGIC 2 to DIGIC 8 ), compiled from platform/portable.000 with CONFIG_BOOT_BOOTFLAG = y. You may review this code by running it in QEMU if you prefer. If you (or anyone else) are OK with the risks, just send me a PM and I'll give you the FIR file. In the emulator, if you run with firmware="boot=1", this option enables the boot flag, so you can see what exactly the firmware does differently. It will check the card contents at every startup, so there might be a small delay after this change. Other than that, with a regular (non-bootable) card is inserted, the camera will run plain Canon firmware. 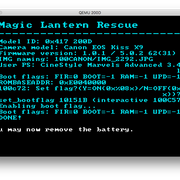 Before compiling ML ( " make -C ../magic-lantern 60D_install_qemu " ) I got the same screen of ML Rescue that I got directly from my camera. 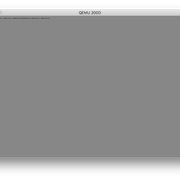 The emulation doesn't go very far; it doesn't show the GUI yet. It covers the bootloader, SD card I/O and roughly half of the startup process. At some point it times out waiting for the second CPU, as the communication between them is not well understood. In this simulation, the boot flag would be already enabled, so the above won't show anything interesting (Canon code will attempt to flash the ROM only if the flag is actually changed). You could try to disable the boot flag instead (like this), as the emulation runs with boot flag enabled. In this case, you will see some low-level activity and the emulator will lock up. That's OK. It will print the address of the function it's going to call from Canon's bootloader, and you can look it up in the disassembly to confirm it's indeed the right one and has the correct syntax ( I already did that, but you should probably not trust me blindly ). Which file should I edit to make this changes? You should also be on the "recovery" branch. Why my ROM starts after the addr in the previous comment? And... what's the next step? Loading the FIR with the bootflag enabled from a real camera? 0xE0000000 is the start address of the first ROM chip (we call it ROM0). 0xE0040000 is the address of Canon's main firmware. Below that address, you can find Canon's bootloader; they are both in the same physical ROM chip. Yes, the next step is running the FIR on real hardware and praying things won't go wrong. Is it the only problem? What should I expect installing this FIR? Should I copy both the ML's FIR and the Canon's firmware update on the same SD card to be safe? Sorry for the questions but I just want to make sure what I'm doing. That's the only surprise we had so far with this procedure, but anecdote != data. Anything can happen. Expected outcome - see e.g. for 80D. If you copy both FIR files, Canon's bootloader will just pick one. So, you should copy only one FIR. Loading the FIR that enable the bootflag will avoid the warranty? Can I reset the bootflag in the future? I own a 77D and I would love to help the development. Is there anything I can do? Unfortunately, I have zero expereience with coding. I'm trying to find stubs for 77D, using 200D as a reference. NSTUB(0xE01E781F, mpu_send) // "dwSize < TXBD_DATA_SIZE"
Still missing a couple of references to data structures. After figuring out it should be able to run the same minimal code as current state of 200D. If someone want to double check and find the remaining stubs, please write down here your finding. does ML even work for 200D? Through rom dumpers are we able to expand the range of the video codec on the 6d mk2? Misconception: ROM dumpers read ROM data from cam. That's a very basic step in ML development. Don't hold your breath waiting for ML files loaded from card and ML code running in the cam. Devs just taking the very first steps in a very, very long journey. Don't know what you expect in "codec range expanding" but you may take a look into what ML enabled cams are actually able to do. You may be disappointed, though. What if i want to run some simple code on my 200D? Like a simple calculation and store it in the RAM or some accessible space. What can i do too access the full CPU instructions in assembler? I am not looking for fancy Screen gui's and touch or anything above those categories. You can already do that in the emulator - see e.g. reply #83. For example, a simple intervalometer coded in C would be very easy to write. After enabling the boot flag, you will be able to do the same on real hardware. Proof of concept code was already tested and confirmed to work. I'm looking for a volunteer willing to be the first one who enables the boot flag on DIGIC 7 (see previous page); nobody took the risk yet. The FIR file for enabling the boot flag for 200D is ready, just drop me a PM if (or when) you are prepared to run it. 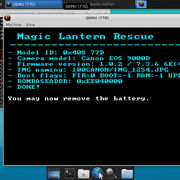 I didnt undertand how to install the magic lantern on 77d, someone can help? I also did the test with changing reboot.c to disable the boot flag. Is the output of this still relevant for anybody? - I unterstand the next step is to collect the stubs. Is there already a more complete list than aprofiti posted on October 1st? - In branch "digic6-dumper" I see directory "platform/77D.100". Shouldn't this be "77D.102" since the current firmware version is 1.0.2? - Is there a repository where people work together on porting to the 77D? Thanks you so far for the good documentation. I hope I can help to get some steps further to a working port of ML for the 77D. PS: If you are interested on how I created my environment have a look at https://github.com/calle2010/magic-lantern-77d-vagrant. I use Vagrant and VirtualBox hosted on MacOs. Very nice! Not familiar with vagrant, but if it makes easier to setup a build environment, it might be an interesting option. I've tried Docker some time ago, but the experience wasn't straightforward. I couldn't install it on my main machine (OpenSUSE Tumbleweed), so I had to try it in a virtual machine. Moving qemu.monitor into /tmp sounds interesting. That's the most complete one. I didn't double-check them yet, only noticed the Thumb bit was not set in most of the stubs (and it should be; refer to 200D for details). Emulation is at the same level as 200D and all other DIGIC 7 ports. It gets stuck as soon as the two cores expect to talk to each other. I hope this experiment is going to capture the info needed to understand these interactions, but it has to be adapted to the ARMv7 architecture. The two cores are talking via MMIO registers, interrupts, and they both access the same memory (flat mapping, except for a private 4K page for each core, just like EOS M5). That's right. Initial experiments on 77D were done before Canon published a firmware update. The digic6-dumper branch currently covers the DIGIC 6 and newer models, so... that's pretty much it. RE notes and other findings are shared on the forum. Some bootloader experiments can be found in the "recovery" branch. That's portable code, running on all models since DIGIC 2. BTW, we could successfully enable the boot flag on 200D; will post the FIR files soon. I do only my first steps with Vagrant. I want to automate all the manual steps and setting up the build environment on my MacOS created too much clutter for my taste. This was just the first place that came to my mind. The working directory in this setup is on the VirtualBox filesystem mounted with nodev, so creation of the socket fails with "no permission" error message. I didn't double-check them yet, only noticed the Thumb bit was not set in most of the stubs (and it should be; refer to 200D for details). I will check the 200D code and see if I can find the same stubs for 77D. My assembler experience is very limited, though. Also I do not yet quite understand how to test the stubs without the GUI emulation. Also I do not yet quite understand how to test the stubs without the GUI emulation. The emulation goes far enough to start a couple of Canon tasks; it even initializes the virtual SD card and is able to save logs. That's pretty much what can be tested at this stage. Once the startup process works, you'll be able to get logs directly from the camera and start experimenting.